Safety Baby self-closing outlet covers. Safety Baby self-closing outlet covers helps prevent access to outlets. They're an attractive and convenient way to help protect children from potentially dangerous electrical outlets. These outlet covers protects instantly and automatically, sliding into position the moment you remove a plug from the outlet. 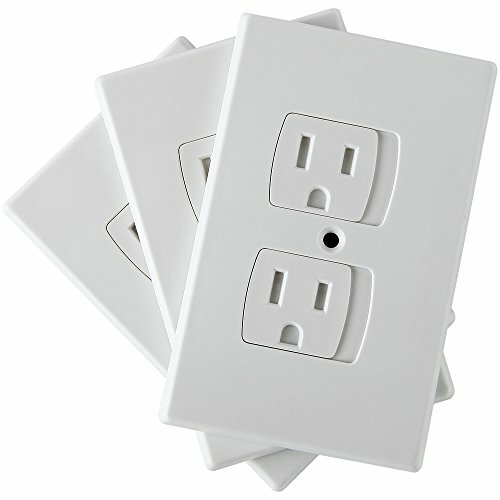 These outlet covers come in a pack of three and can be used as permanent covers for standard and decor style outlets. They can be screwed and installed easily without any hassle. Features: Works on both standard and decor style outlets permanent solution to prevent children from choking hazards from conventional outlet plugs, allowing you to have a piece of mind while away from home. Automatically covers the outlet when device is removed helps prevent injury from inserting objects into outlet multipack contains 3 outlet covers. Guarantee: These outlet covers are designed with safety being the priority. Although we offer the guarantee, we are sure that you will find these covers to be high quality and the best design on the market. Don't wait any longer to protect your child(Ren). Order your self-closing outlet covers today. Don't forget the bedrooms, living rooms and playroom. If you have any questions about this product by Jambini, contact us by completing and submitting the form below. If you are looking for a specif part number, please include it with your message.